Edna M. Westerman, 97, of Upper Sandusky, Ohio, passed away on Tuesday August 21, 2018 at 10:00am at Westbrook Assisted Living and Memory Care in Upper Sandusky. Edna was born on August 10, 1921 in Wyandot County, Ohio, to Samuel and Eva (Zeigler) Traxler, both of whom are deceased. She married Robert Westerman on March 24, 1943 in the Trinity Evangelical Parsonage in Upper Sandusky, and he passed away on January 10, 2013. She is survived by two sons, Larry (Joanne) Westerman, and Richard Westerman, both of Upper Sandusky; grandchildren, David (Lisa) Westerman of Alaska, Sheri (Scott) Gatchell of Carey, and Scott (Heidi) Westerman of Hilliard, along with great grandchildren, Erika DeLapp, Jimmy Westerman, Josh Westerman, Hayes Gatchell, Megan Gatchell, Luke Westerman, and Parker Westerman. Edna was preceded in death by her parents, husband, four brothers: Woodrow, Paul, David and Wayne Traxler; and three sisters, Mildred Etheridge, Thelma Traxler and Norma Jane Blackburn. She was a 1940 graduate of Eden High School and went on to work at G.E. in Bucyrus for three years and then the former Millington Plastic for 13 years. 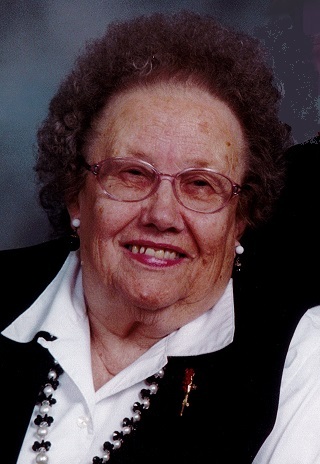 Edna was a member of Trinity Evangelical United Methodist Church in Upper Sandusky for over 70 years, being active with the Progressive Sunday School Class, Keenager’s Club, and serving for 45 years in the “Cradle Roll. She was also a former member of the United Methodist Women, and the Wyandot Memorial Hospital Guild. Manor Nursing Home, before it’s closing. She was an avid bicycle rider and frequented garage sales. Her hobbies were collecting turtles and mugs, cooking and baking. She will be remembered for her greatest love and joy, and that was spending time with her family. Funeral services for Edna Westerman will be held at 2:00pm Saturday, August 25, at the Lucas-Batton Funeral Home in Upper Sandusky, with Rev. Jim Stauffer officiating. Burial will follow at Old Mission Cemetery. Visitations will be held on Saturday, from 12:00pm to 2:00pm at the Lucas-Batton Funeral Home. In lieu of flowers, memorials may be made to Trinity Evangelical, Hospice of Wyandot County, Wyandot Memorial Hospital, or Wyandot County Council on Aging and can be sent to Lucas-Batton, 476 S. Sandusky Ave. Upper Sandusky, Ohio 43351.